HAIL CAESAR PEI AGAIN: James Pei successfully defended his Caesar title to remain the BPA Top Gamer of the year in 2015 while adding to his record total of 2,332 laurels. Pei now leads all BPA competitors with three annual metagaming championships. His 33-laurel margin of victory over runner-up Sceadeau D’Tela was more than tripled by his 100 laurels haul in his specialty For the People where he once again swept both the WBC and PBeM competitions. Over the years, Pei has amassed 862 laurels in all versions of the game—a total that would rank him 21st in career laurels for that event alone against the combined event totals of all other competitors. But the Master is no one trick pony—scoring 63% of his laurels in other events—including his second straight WBC Sekigahara title and a pair of CDW thirds in Hannibal and Washington’s War in 2015. Complete details on our top Award winners and the tally of our Top 25 gamers for 2015 are available on the Caesar page. HAIL CONSUL MCNAY: Ewan McNay vaulted over both James Pei and Sceadeau D’Tela to take Consul honors for 2015. Surprisingly, neither of the top Caesar contenders were a serious challenger for Consul honors. The Consul runner-up was the mighty Finn, Riku Riekkinen. His lone win in Commands & Colors Ancients combined with three seconds for 1989, Russian Railroads and Twilight Struggle left him eight laurels behind Ewan’s three titles. Had Riku broken through on any of those three runner-up performances he would have won easily. Stripping away PBeM and Pre-con laurels left McNay in the lead as all of his 120-laurel total was earned during WBC week with triple wins in Ingenious, Britannia and Robo Rally. WBC’s move to a nine-day length will remove the distinction of Pre-Con events as a separate entity for future awards. The only difference between Caesar and Consul going forward will be the inclusion of email tournaments in the former. For a complete list of Consul finalists see our Caesar page. WBC HISTORY UPDATED: Our Annual Year in Review summary and pictorial listing of top Centurions is now posted on our archive. BPA MEDALS/LAURELISTS LIST UPDATE: Our annual compilation of events won and career totals is now posted on our Medals page, with arch villain Bruce Reiff (Boo! Hiss!) again leading the parade in most categories! See our Top 25 gamers and BPA's complete list of Laurelists is also now current through 2015. KEVIN SUDY: We regret to report the passing of Kevin Sudy who died suddenly on Feb. 15, 2016, of a heart attack. Kevin was a longtime member of BPA and a regular at both WBC and several of the BPA mini-cons. He was just 51. Family and friends are invited to Kevin’s Life Celebration at MONEY and KING Funeral Home, 171 West Maple Ave, Vienna, VA on Saturday, Feb. 20th from 3 PM until time of services at 4 PM. Online condolences and fond memories may be offered to the family at www.moneyandking.com. 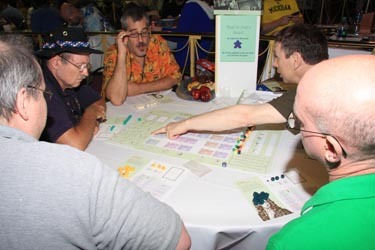 Those wishing to share remembrances of Kevin for use on the BPA Memorial page at a later time are urged to submit same to conventiondirector@boardgamers.org. LAST CALL FOR BoD NOMINATIONS: All BPA members are hereby notified of their right to nominate members for the three Board seats whose terms expire at the next WBC. To appear on the ballot, a member must be nominated in writing by at least three members; one of whom must be himself/herself. Nominations must be signed and received at BPA, 7766 Valley View Court, Hickory, NC 28602 no later than Feb. 28 to be eligible for election in that year. NOTE: Email nominations are NOT acceptable, nor can a member nominate more than one member for the Board. When contemplating nominations, members are urged to consider that the BPA conducts most of its business by email and needs Board members who are able and willing to offer their time and skills to the organization in a timely manner. Board members should be considered more for their ability to contribute to the running of a successful company than for their attachment to any particular game or genre. Besides forwarding a signed nomination, each nominee should submit by March 1 a statement not to exceed 100 words summarizing what they can contribute in service to the Board of Directors of the BPA. The nomination form is online. LAST CHANCE TO CHECK 2015 PATRONS: BPA's list of Patrons for 2015 is now posted online. at http://boardgamers.org. Please report any inaccuracies to conventiondirector@boardgamers.org no later than Feb. 28 to ensure an accurate listing in the upcoming Yearbook. ORPHAN’S LIST UPDATE: The current version of the Orphan’s List is posted and reveals more vacancies than commitments with under a month remaining before the schedule closes. While some lament the annual culling of events, relatively few seem willing to do what is needed to support the events we have—let alone add more. In short, if you decry the passing of event X or the absence of Event Y, where is your offer to run it? Every year, our numerous sponsors and vendors salvage events that failed to make the cut. Every year we fill vacancies by replacing events without a GM commitment from the list of alternates with such a commitment. But in both cases, events can only be added from the list of events that have been registered as alternates by someone willing to serve as a GM and who has submitted an event form. Help us to help you. Get involved. It does far more good to step forward and be a solution rather than complaining that someone else is not serving your interests. We are an organization of volunteers—no one is paid to run an event to entertain you. Even the faithful minority who do so much year after year to serve the majority can help more by committing quickly. Especially during this change in venue year, leaving things to the last minute will make it more difficult to complete everything that needs to be done in this first year in a new facility. Moreover, those who wait till the last minute to claim an event, sew doubt in the minds of potential volunteers. Why should I volunteer to run X, when Joe will do it? And of course when Joe doesn’t do it, the event goes down the tubes. Every time a volunteer submits an event form only to be told he is the second person to do so for that event makes that person more reluctant to step forward again. Every week you leave an event unclaimed that you intend to run makes it more difficult to encourage others to treat vacancies seriously and respond in time to save it or others. Please submit your event forms promptly and by doing so give the Orphan’s List more credibility. The table must be surrendered promptly to the next user before the next reserved time slot. All requests are based on availability, with first come, first served. COMMERCIAL DEMOS & PLAYTESTS: To alleviate crowding in Open Gaming, unauthorized exhibit tables will NOT be allowed to monopolize tables. Monitors will be tasked with strict policing of commercial efforts including prospective game designers who set up displays to troll for P500 backing. While you are free to Open Game anything you like, you will NOT be allowed to monopolize tables with displays that are not being actively played. Instead, designers/publishers are urged to register for FREE scheduled demos in the Exhibit Annex demonstration area. To be included in the schedule, you must be a current Sustaining level or higher member and register your demo before June 1st. Multiple or long demonstrations are allowed on a space available basis. Contact conventiondirector@boardgamers.org for additional information. Include alternate times and type of table desired (either 5' rounds or 6' x 30" rectangulars) as well as boxart files containing the title of the game for display signage. Reservations will be made on a first come, first served basis. Submit requests to http://boardgamers.org/forms/DemoForm.htm. NAVAL GAZETTE: If you’re wondering how a golden oldie like Wooden Ships & Iron Men can thrive at WBC some four decades after its release, check out the free newsletter put out by its dedicated GM. For a free subscription contact hitchings@Juno.com. WBC LODGING: As happens every year, the hotel is sold out for most prolonged stays. There are exceptions. If you come early for a short stay, there are still vacancies to be had and cancellations occur all the time because people reserve early and worry about attending later. That is why we are considering a No Cancellation policy in the future. However, there are alternatives. Start by calling the hotel at 1-866-437-1300 and checking the dates you are interested in. If they cannot help you, ask to be put on a callback list for the inevitable cancellations. However, the availability of condominiums, chalets and cabins on property as well as lodging in nearby Hidden Valley and elsewhere means that there is still lodging to be had. The reservationist can direct you to it. We encourage those who would benefit from the enhanced accommodations of a condo to make the switch (especially if you will have access to a car). The reservationist at 1-866-437-1300 can give you more details on the various options available including nearby offsite lodging. CONDOMINIUMS: A wonderful feature of Seven Springs is the availability of nearby condominiums on the property that can be rented for stays of two days or more once reservations are accepted for stays of that duration as per the above schedule. These are available in varying sizes of one-, two-, three- and four-bedroom units for the daily rate of $129 per bedroom. Those who can group together with friends and family to cohabit these units will find these accommodations most welcome given their inclusion of kitchens and common living room areas that can enhance your visit—especially for those considering extended stays. While having access to a car is recommended for condo rentals, it is not required as free shuttle service is available on property around the clock. Even when the hotel website lists no vacancies, condo/chalet/cabin rentals are available. Call 1-866-437-1300 to speak to a reservationist about the options. The reservationists are available to answer your questions and will even recommend nearby unaffiliated housing. For those willing to orchestrate their groups into multi-bedroom condo units, this represents a great opportunity for group bonding and sharing that could enhance your convention experience more than the typical hotel room stay and was a major reason we chose to have WBC here. Multi-bedroom condos are rented to one individual who is responsible for payment for all bedrooms in that unit. Individuals getting together to share a condo, need to elect one amongst themselves to handle the payment for the entire group. If looking for someone with which to share a condo or room to lower your expenses use our social media forums to reach out to others. CHALETS/CABINS: For those interested in lodging for larger groups, there are a limited number of multiple unit chalets still available. The chalets are recently renovated and have the advantage of being within walking distance of the hotel in addition to kitchen and living room advantages. Chalets are not to be confused with cabins. Cabins are rustic (no air conditioning) and remote, but have the advantage of being more affordable. SHUTTLE SERVICE: Shuttle Service (not to be confused with reserved Shuttles to/from Pittsburg Airport or Connellsville train station) is available around the clock on property between the hotel, cabins and condos. It is not available to Hidden Valley, other hotels, or off-property locations. OFF PROPERTY LODGING: Those looking for lower priced accommodations should google “hotels near seven springs resort pa”. There are numerous hotels and campgrounds of varying price points within a short drive in nearby Somerset, Donegal and elsewhere. These overflow accommodations are no more distant than those used at numerous major gaming conventions in the U.S. and lack the traffic congestion associated with such overflow lodging elsewhere. Given the Route 30 traffic congestion of our previous location, those staying offsite may find the commute no longer time wise than what they may have experienced in the past. AIRPORT SHUTTLES: Shuttle service can be arranged by calling 814-352-7777 Ext. 5000 for transportation to and from the Pittsburgh airport or Connellsville train station. The cost is $20 per person (round trip) to/from the airport ($10 to the train station) which is non-refundable and must be pre-paid. At this point, times are approximate and subject to change based on demand but the initial plans are to run three shuttles per day at 10 AM, 2 PM and 7 PM from Saturday thru Wednesday. Thereafter, the emphasis will be based on departures with increased incidence based on Saturday and Sunday departures. BREAKOUT NORMANDY: The tenth BPA PBeM Tournament for Breakout Normandy will commence on March 1 using the L2 edition rules. The Single Elimination event will have five-month rounds. For all the other details see https://sites.google.com/site/breakoutnormandytournament/home-page.